Is the Tonkinese cat good for you? The Tonkinese is a happy cat, enjoying all of life's pleasures along with you, the pet parent. Tonkinese cats interact well with most other pets and humans although they are high energy. The Tonkinese is a popular cat amongst Siamese fans who want a less extreme body style. A cross between the Siamese and Burmese breeds, the Tonkinese was first created as a way to split the difference between these two very popular, but different, breeds. 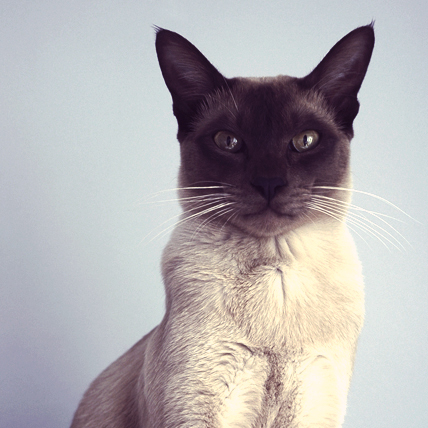 Canadian breeder Margaret Conroy ended up crossing a seal point Siamese with a sable Burmese in the early 1960s, the result being the first litter of Tonkinese. The breed was registered in the United States in 1975. The Tonkinese is a medium sized breed that has a well-muscled build and a soft, thick coat. Their wedge-like head is not quite as pronounced as their Siamese ancestor, but not blunted like their Burmese predecessors. They have a somewhat rounded chest, average sized ears, and thin, muscular legs that are longer in the rear, giving them the impression that they can jump to the moon. The Tonkinese is sort of like the Travelling Wilburys of cats, being the amalgamation of two of everyone’s favorite breeds. As such, this breed retains only the best characteristics of their parts, being an intelligent, thoughtful, loving, and playful breed. Loving more to ride around atop your shoulder than by your side, this cat is one for close encounters. Also a friend to all, this breed will be sure to make an appearance any time you have company. Great with kids, pets, and strangers alike, this breed is known for being a complete mush. The Tonkinese can come in a few different patterns and colors, like cream, red, blue, chocolate, brown, lilac, tortie, and tabby.